Lee Louis Daniels (born December 24, 1959) is an American film and television producer and director. He produced Monster's Ball and directed Precious, which received six Academy Award nominations, including Best Director; the film won two of the awards. In 2012, Daniels directed The Butler, a historical fiction drama featuring an ensemble cast portraying unique events on the 20th century presidents of the United States at the White House. Daniels is also a co-creator, executive producer and director of the television series Empire that debuted in 2015. Daniels was born on Christmas Eve, 1959, the son of Clara Watson and William L. Daniels, in Philadelphia. He graduated from upscale, suburban Radnor High School in 1978, and then Lindenwood University in St. Charles, Missouri. He couldn't afford film school, so he started in a liberal arts college in Missouri but realized it wasn't for him, and started working as a receptionist in a nursing agency in California. Realizing he could do it on his own, he quit the job and started his own agency. He sold the company and went to work casting actors using his skills from 'casting' nurses. He began his career in entertainment as a casting director and manager after a chance meeting with a Hollywood producer, working on such projects as Under the Cherry Moon and Purple Rain. He continued managing talent. The documentary My Big Break features Daniels early in his career when he was managing actor Wes Bentley who starred as Ricky Fitts in American Beauty. In the documentary, Daniels comments on Bentley's reluctance to capitalize on his newfound celebrity status. Lee's father, Philadelphia police officer William Daniels, was, as Daniels says, "killed in the line of duty" when Lee was a teenager, in 1975. Daniels has been about his father's being violent and physically abusive towards him, and even tried "to beat it [being gay] out of me." Daniels' younger sister Leah is a casting director. He also has four younger brothers. Monster's Ball, the debut production of Lee Daniels Entertainment, was a critical and box office success. Halle Berry won the Oscar for Best Actress; the film was also nominated for Best Original Screenplay. Daniels' 2004 production The Woodsman, starring Kevin Bacon, Kyra Sedgwick and Mos Def, premiered at the Sundance Film Festival. It went on to garner three nominations at the 2005 Independent Spirit Awards, the CICAE Arthouse Prize at the Cannes Film Festival, the Jury Prize at the Deauville International Film Festival and a "Special Mention for Excellence in Filmmaking" award from the National Board of Review. Daniels at the 2009 Tribeca Film Festival. Former president Bill Clinton persuaded Daniels to produce public service announcements to encourage young people of color to vote. The campaign was launched in March 2004 and featured Grammy winners actor/musician LL Cool J and Alicia Keys. Daniels' first directorial effort, 2006's Shadowboxer, debuted at the Toronto International Film Festival. It starred Helen Mirren, Cuba Gooding, Jr., Stephen Dorff, Vanessa Ferlito, Mo'Nique, Joseph Gordon-Levitt and Macy Gray. It was nominated for Best New Director at the San Sebastian Film Festival. Daniels' 2008 production Tennessee was written by Russell Schaumberg and directed by Aaron Woodley (Rhinoceros Eyes), the film is about two brothers, played by Adam Rothenberg and Ethan Peck, who travel from New Mexico to Tennessee to search for their estranged father. Along the way they meet Krystal (Mariah Carey), an aspiring singer who flees her controlling husband (Lance Reddick) to join them on their journey. His 2009 film Precious told the story of an obese, illiterate, 16-year-old girl (Gabourey Sidibe) who lives in a Section 8 tenement in Harlem. She has been impregnated twice by her father, Carl, and suffers long-term physical, sexual and emotional abuse from her unemployed mother, Mary (Mo'Nique). Carey also appeared, in the role of a social worker. The film screened at the 2009 Sundance Film Festival and went on to garner widespread acclaim. Daniels was nominated for the Academy Award for Best Director, and the film received a Best Picture nomination. It was a financial success grossing $63 million worldwide against a budget of $10 million. In 2010 Grace Hightower De Niro, who appeared in Precious, presented Daniels with the Pratt Institute's Creative Spirit Award. Daniels directed The Paperboy (2012), based on the 1995 novel by American author Pete Dexter who penned the original script which was further developed by Daniels, and starring Matthew McConaughey, Zac Efron, John Cusack, and Nicole Kidman. The film competed for the Palme d'Or at the 2012 Cannes Film Festival. He directed the historical fiction drama film The Butler (2013), starring Forest Whitaker, John Cusack, Jane Fonda, Mariah Carey, Terrence Howard, Alan Rickman, and Oprah Winfrey. The Butler received positive reviews from critics and grossed over a $100 million in the United States against a budget of $30 million. Recently, Daniels is in the production of a biopic of Richard Pryor starring Mike Epps and Oprah Winfrey. Empire, a television series created by Daniels, premiered on January 7, 2015. Daniels directed the first episode and co-wrote it with The Butler screenwriter Danny Strong. The series stars Terrence Howard and Taraji P. Henson, and is about a family's music empire. In 2015, Daniels was listed as one of the nine runners-up for The Advocate's Person of the Year. In June 2016, the Human Rights Campaign released a video in tribute to the victims of the 2016 Orlando gay nightclub shooting; in the video, Daniels and others told the stories of the people killed there. On September 16, 2015, Daniels was asked about actor Terrence Howard saying that his first wife "was talking to me real strong, and I lost my mind and slapped her in front of the kids" and that he got physical with his second wife too in a September 2015 Rolling Stone interview. Daniels excused the domestic violence and turned Howard into the victim saying "that poor boy." Then he said that Howard hasn’t done anything that Sean Penn hasn’t done. A week later, Daniels was sued by Penn in a $10 million defamation lawsuit. The lawsuit states that "Daniels falsely equates Penn with Howard...Penn (unlike Howard) has never been arrested, much less convicted, for domestic violence, as his ex-wives (including Madonna) would confirm and attest." Penn dropped the lawsuit in May 2016 after Daniels retracted his statement and apologized. 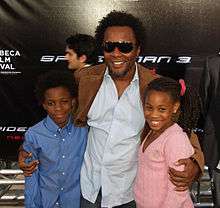 Daniels with his son and daughter at the 2007 world premiere of Spider-Man 3. Daniels lives in New York City. He is openly gay. He and his then-partner, casting director Billy Hopkins, adopted Daniels' biological niece and nephew, Clara and Liam. Hopkins and Daniels later separated. Daniels was subsequently in a relationship with Andy Sforzini until they separated in 2010. ↑ "Lee Daniels Biography". TV Guide. Retrieved March 17, 2014. ↑ "Radnor Alumni Council/Notable Radnor Alumni". Schoolwires, Inc. Retrieved August 21, 2013. ↑ Snodgrass, Mary Ellen. "Lee Louis Daniels: Biography". Gale Contemporary Black Biography. Retrieved September 3, 2007. ↑ "Iconoclasts (2005– ) : Lenny Kravitz and Lee Daniels". IMDb.com. Retrieved 2016-12-03. ↑ Fresh Air from WHYY. "A Director's 'Precious' Project". NPR. Retrieved August 21, 2012. ↑ "Out100: Lee Daniels". www.out.com. Retrieved 2016-01-14. ↑ "Reflections for Corporal William L. Daniels...". Officer Down Memorial Page. The Officer Down Memorial Page, Inc. Retrieved August 21, 2013. ↑ "'Precious' Director Lee Daniels Says His Dad Tried Beating The Gay Out of Him And He Loves Him For It!". Moguldom Media Group. Retrieved August 21, 2013. ↑ "Leah Daniels profile". IMDb.com. Retrieved August 21, 2013. ↑ "Lee Daniels profile". IMDb.com. Retrieved August 21, 2013. ↑ "Exclusive: Precious Director Lee Daniels". comingsoon.ne. October 30, 2009. Retrieved September 20, 2013. ↑ "The Woodsman". boxoffice.com. December 24, 2004. Retrieved September 20, 2013. ↑ "The Woodsman (2004)". New York times. Retrieved September 20, 2013. ↑ "Lee Daniels on 'The Butler,' Working with Oprah, Trayvon Martin, and Race in America". Daily Beast. August 12, 2013. Retrieved September 20, 2013. ↑ "In 'Shadowboxer,' Murder Runs in the Family (and It's a Turn-On in a Lover)". The New York Times. July 21, 2006. Retrieved September 20, 2013. ↑ "ShadowBoxer". sansebastianfestival.com. Retrieved September 20, 2013. ↑ "Lee Daniels Explains Why 'Mariah Got The Role Meant for Janet Jackson'". June 14, 2009. Retrieved September 20, 2013. ↑ McCarthy, Todd (December 3, 2008). "Sundance unveils competition lineup". Variety. Retrieved November 5, 2009. ↑ "Precious: Based on the Novel "Push" by Sapphire". Box office mojo. Retrieved September 20, 2013. ↑ "2012 Official Selection". Cannes. Retrieved April 19, 2012. ↑ "Cannes Film Festival 2012 line-up announced". timeout. Retrieved April 19, 2012. ↑ "Lee Daniels' The Butler". Metacritic. Retrieved September 20, 2013. 1 2 "Lee Daniels' Richard Pryor biopic to star Mike Epps". BBC News.com. Retrieved August 28, 2014. ↑ Advocate.com Editors. "Person of the Year: The Finalists". Advocate.com. Retrieved 2015-11-06. ↑ Hedegaard, Erik (2015-09-14). "Page 5 of Terrence Howard's Dangerous Mind". Rolling Stone. Retrieved 2015-10-06. ↑ "'Empire's' "Batshit Crazy" Behind-the-Scenes Drama: On the Set of TV's Hottest Show". Hollywood Reporter. 2015-09-16. Retrieved 2015-10-06. ↑ "Sean Penn files $10 million suit against Lee Daniels". CNN.com. 2015-09-23. Retrieved 2015-10-06. ↑ Eriq Gardner (2015-09-22). "Sean Penn Files $10 Million Defamation Lawsuit Against 'Empire' Co-Creator Lee Daniels". Hollywood Reporter. Retrieved 2015-10-06. ↑ "PENN". Documentcloud.org. Retrieved 2015-10-06. ↑ Gardner, Eriq. "Sean Penn Wins Apology from Lee Daniels in Defamation Settlement". Retrieved September 28, 2016. ↑ "Lee Daniels came out as gay man 'because I loathed my dad so much'". NY Daily News. 2013-11-14. Retrieved 2015-11-06. 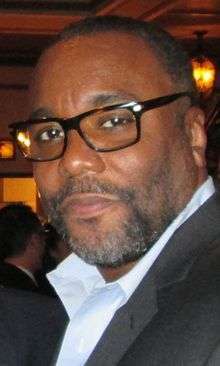 Wikimedia Commons has media related to Lee Daniels.